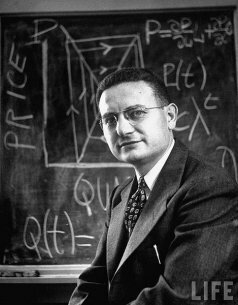 The papers of preeminent American economist Paul A. Samuelson (1914-2009) will be added to the Economists Papers Project in the Rare Book, Manuscript and Special Collections Library at Duke. Samuelson was the first American recipient of the Nobel Memorial Prize in economics. Prior to his death on 13 December, Samuelson had made the decision to donate his papers to Duke where they will join the collections of his MIT Nobel Prize-winning colleagues Robert Solow and Franco Modigliani, as well as those of Nobelists Kenneth Arrow, Lawrence Klein (Samuelson’s first Ph.D student), Douglass North, Vernon Smith, and Leonid Hurwicz. The Economists Papers Project, developed jointly by Duke’s History of Economics group and the Special Collections Library, is the most significant archival collection of economists’ papers in the world. Read the full story from the Duke University Libraries.